Foton Philippines is pushing its bid to be recognized as a mainstream car brand in the Philippines by launching the much-awaited automatic transmission variant of its Toplander midsized SUV. Available solely as a 4x2 variant for now, the Toplander A/T is available in two variants: the value-oriented 4x2 EL A/T and the premium-trimmed 4x2 EX A/T. Both models are powered by a Euro V compliant 2.8-liter Cummins ISF common rail direct injection diesel engine. The higher emissions compliance has been achieved by its Exhaust Gas Recirculation (EGR) system and DOC (Diesel Oxidation Catalyst). It generates a stout 161 horsepower at 3,600 rpm and 360 Nm of torque from as low as 1,800 rpm. Mated to the engine is a 6-speed automatic. Sourced from Daimler, the parent company of Mercedes-Benz, this transmission comes with a manual shift override and four driving modes: Normal, ECO, Sport, and Winter. The EX even gets cruise control. Outside, it’s distinguishable by its wheels with the EL getting 265/70 R 16 tires and the EX receiving 265/65 R 17 tires. The EX also gets chrome side view mirrors with LED turn signal indicators while the EL goes for body-colored ones, but still with LED turn signal indicators. Both variants are upgraded from the 4x2 M/T variant in that they get chrome window moldings, LED daytime running lights, side step boards, and roof rails. In terms of convenience features, both Toplander 4x2 A/T models come well-equipped with automatic headlights, rain-sensing-wipers, and a leather-wrapped steering wheel with audio controls. The EX is decidedly more upscale with standard leather seats and a larger 2-DIN touchscreen infotainment system with Bluetooth hands-free. Foton is also upping the Toplander’s safety equipping both variants with dual SRS airbags, anti-lock brakes (ABS) with electronic brakeforce distribution (EBD), and brake assist (BA). Improving its all-weather stability and safety, they also get Limited Slip Differential (LSD), ESP (Electronic Stability Program) with built-in traction control, Hill Descent Control (HDC), and Hill Hold Control. Maneuvering is made easy with reverse parking sensors on both variants with the EX getting the added benefit of a reverse camera. Assembled at the company’s sprawling Clark, Pampanga facility, Foton Philiippines is aggressively pushing for increased Toplander sales and this can be seen in the pricing. 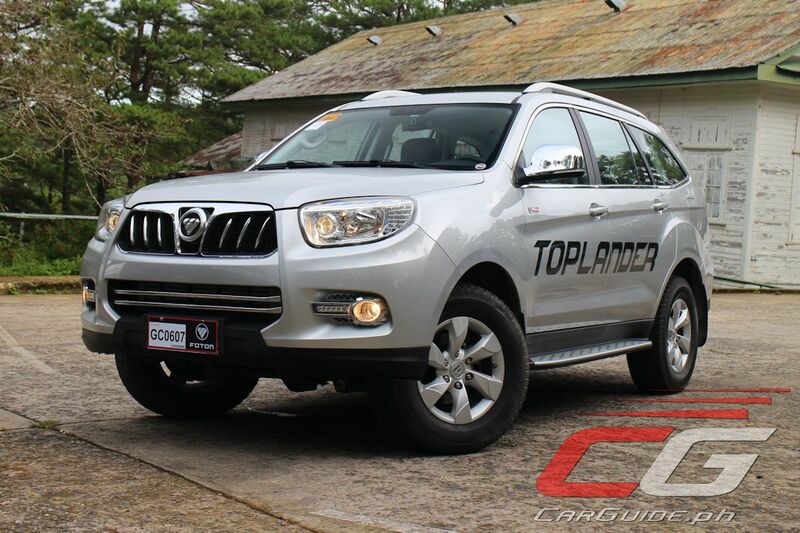 The Toplander 4x2 EL A/T retails for P 1,280,000 while the Toplander 4x2 EX A/T retails for P 1,400,000. Both variants are available for reservations at all Foton dealerships nationwide with customer delivers to start by end of October. Safety and Security: Engine Immobilizer; Vehicle Alarm, Electronic Stability Program (ESP); Anti-Lock Braking System (ABS) with Electronic Brakeforce Distribution (EBD) and Brake Assist (BA); Traction Control System (TCS); Dual SRS Airbags; 3-pt ELR Seatbelts with Locking Retractors; Reverse Sensors; Hill Descent Control; Hill Hold Control; Child Lock; Anti-Pinching Windows; Daytime Running Lights (DRL); Limited Slip Differential (LSD); Central Locking. EX variant: adds Reverse Camera. Comfort and Convenience: Keyless Entry with Hold Window Down Control; power windows, door locks, and mirrors; headlamp levelizer; dual air conditioning; steering wheel controls; adjustable meter back light; driver seat height adjustment. EX variants adds: cruise control, leather seats, driver seat height and lumbar adjustment; steering wheel audio control for audio and mobile functions. Seems good , with Cummins engine and Merc transmission. But how about the electronics especially the one controlling the driving. Is it reliable? Hindi ba prone to SUA ito? Sorry for being paranoid-sounding but kinda interested on this vehicle. I hope you have info on where it's (electroics) made or maybe some other review sites about this automatic, if it's really safe. Thanks sir. I somehow think this will sell well once the excise tax takes effect. Interesting car. Do you think all of it's electronic safety features will give a piece of mind to it's user and especially for the passengers. Spare parts shouldn't be a problem? Unlike Toyota, spare parts will then be all original from casa. It's given because Foton Toplander is just new. What makes it appealing though is the Cummins engine and the Daemler A/T system.